To commemorate the 100th anniversary of the sinking of the RMS Titanic, members of our Central Florida Community Choir will present a concert version of the Tony Award winning Broadway show, Titanic – The Musical, as its 2012 Summer Broadway Series performance. The legendary sinking of the RMS Titanic in the early morning hours of April 15, 1912 is unquestionably the most tragic maritime disaster of the 20th century. Follow the stories of the passengers and crew of the supposedly “unsinkable” ship, in this hauntingly moving story set to song. 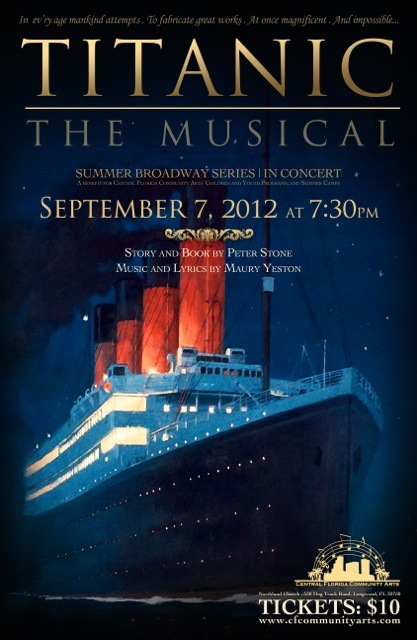 Winner of five Tony Awards, including Best Musical, Best Score, and Best Book, our concert version of Titanic – The Musical is sure to be an unforgettable and thrilling theatrical voyage. The concert is scheduled to be performed on Friday, September 7, at 7:30pm at Northland Church, a 3,100 seat, state-of-the art venue found at 530 Dog Track Road, Longwood, FL 32750. Tickets will be $10.00 each and children age 3 and under will be admitted for free. The Nature’s Table Cafe in the Northland lobby will be open at 5:30pm on the night of the show – come early and eat dinner! Proceeds from this performance will benefit our Central Florida Community Arts’ Children & Youth Arts’ performance and Summer Camp programs.